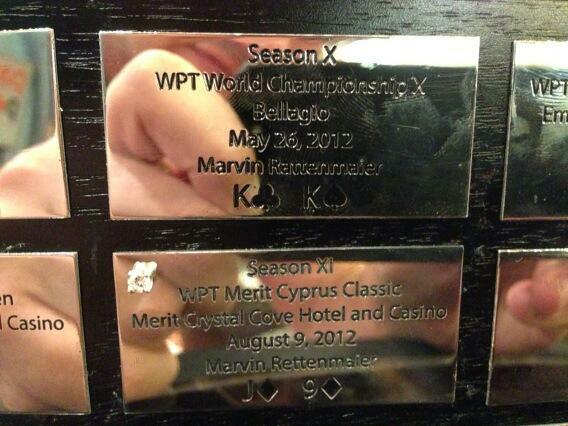 Cyprus was a happy hunting ground for Marvin Rettenmaier in 2012 with a win in the WPT Merit Cyprus Classic Main Event. The German will have fond memories of his 2013 visit to the Mediterannean island after taking down the High Roller tournament at the same event. The German pocketed $180,000 for his efforts, eventually defeating Roger Hairabedian after a marathon heads up session that didn't finish until 8am. The latest High Roller win takes Marvin's career earnings to $4,366,198. Despite all those big wins not everyone would consider Rettenmaier a famous name. Take the person charged with engraving the names on the WPT winner's trophy for example. The German tweeted a photo showing that they had somehow managed to spell his name incorrectly following his win at the WPT Championship at Bellagio last year. We're sure that the $1,196,858 proved to be ample compensation.